Falls on construction jobs are the leading cause of death, with nearly 300 fatalities in 2013. While some accidents are unavoidable, many falls result from mistakes that could have been prevented which only adds to the tragedy. Being aware of the common mistakes that cause falls on the job can go a long way toward making the workplace safer. Incorrect equipment takes on several fronts. It could involve equipment that is inappropriate for certain tasks. Body belts, for example, can help you get into proper position and prevent falls. However, they offer no protection if one occurs. If the potential for a fall exists, it is imperative to use a full body harness. If you work at heights of six feet or greater, you’ll need a Personal Fall Arrest System (PFAS). 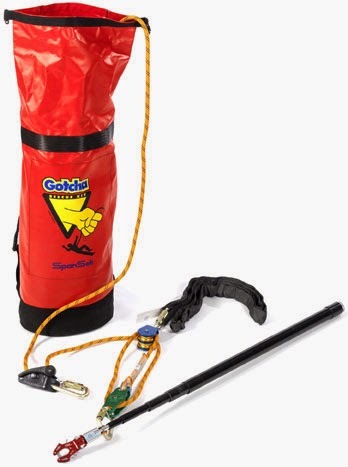 It consists of a full body harness, lanyard/lifeline, and secure anchor points. All components are necessary to protect you from the risk of a fall as well as its impact if one occurs. When used properly, it could save your life or that of a co-worker. Likewise, certain jobs require equipment that can handle the particular hazards of some tasks. Workers who use welding equipment should opt for a body harness that has webbing which is burn resistant and arc-flash protective. A worker who needs to reach sites by climbing should use a harness with a frontal attachment point. While you’ll find different types of harnesses, connecting devices, and anchor points, that doesn’t mean that these parts are interchangeable. So the mistake of using incorrect equipment also includes not using the right parts in the PFAS. These systems are designed to work in concert with the other components. Before using a PFAS, you should inspect all components including the harness, connection, and anchor point. The harness is of particular importance since it will help distribute the force of a fall to reduce the risk of injury that can occur even if you don’t fall. The impact of a sudden stop can cause serious bodily harm. The Occupational Safety & Health Administration (OSHA) recommends bending 6-inch increments of the belt of the harness and examining it for signs of damage like wear, frays, or cuts. You should also make sure that the rivets are intact and lie flat against the material. This inspection is essential prior to using a body harness. It may seem unnecessary especially for something that gets frequent use. However, a small tear is much easier to repair than one that has gone undetected. In the meantime, everyone using the same equipment is at risk for a fall because of this avoidable mistake. Using damaged equipment puts you at a greater risk for a fall. A PFAS can only protect you as well as the integrity of your gear remains intact. Damage from whatever cause represents a weak point that can give way in a critical situation. Equipment with tears or any other sign of deterioration should be repaired by an authorized service center or destroyed. It’s essential that damaged safety gear is not placed back into general use. That is what makes an inspection of the equipment critical whether it’s before a single use or as part of an annual inspection of safety equipment. This measure also applies for harnesses that show signs of impact from a damaged fall indicator. These harnesses should never be reused. Store safety equipment in a clean, dry space out of direct sunlight to prevent damage caused by environmental factors. Along with regular inspections, these simple measures can ensure a safe workplace and prolong the life of a PFAS by keeping it in proper working order and repair. The best safety equipment does little good to prevent falls if you don’t use it correctly. That means ensuring that a body harness fits properly before going on the job. Your body harness should fit snug, but not too tight to avoid creating pressure points. You should also adjust your chest strap so that it doesn’t sit too high on your sternum to avoid injury in case of a fall. You should position your back strap so that you don’t sit too far forward or too far back in the harness. Failure to do so could result in you falling out of the harness. The proper fit will ensure that the force of a fall goes from the D-ring down the back strap to the sub-pelvic straps where your body can best handle the impact of an arrested fall. Most accidents can be avoided with proper instruction about the use and care of safety equipment. Your supervisor should instruct all workers how to use the equipment as well as how to recognize the damage that could lead to failure. No one should use a PFAS without training by a competent person. Lack of training also applies if a work site has changed in some way that can affect current fall protection procedures. If changes are made to the site or your plan, retraining by a component person with proper experience and authority is essential no matter how long everyone has been on the job. However, the training doesn’t stop with equipment use. It should also include a plan for rescue in the event of a fall that has been arrested. While a PFAS will prevent a free fall, a rescue plan is necessary to reduce the risk of suspension trauma caused by an incapacitated worker left in an upright position for too long. Often, falls on the job can be prevented by simply using the proper equipment in the right way. That means ensuring it is in good shape without damage that could cause it to fail. It is both the responsibility of the employer to provide training and for the employee to learn all that it entails. Only then can you prevent falls caused by common mistakes. Violating federal government guidelines is serious and can shut down your new project. The United States Department of Labor publishes a list through the Occupational Safety and Health Administration (OSHA) on a frequent basis to inform employers of the guidelines, the most common violations, and how to fix them before an on-site inspection. The following overview lists the top most frequently cited standards during an inspection. By following the guidelines to avoid OSHA violations, you can increase the safety rating in your workplace while reducing the number of accidents and falls. Not Following Fall Protection Standards – A worker on elevations higher than four feet in the general industry, five feet in shipyards, and six feet in construction zones should wear a persona fall protection system, use a guardrail system, or safety net systems. This includes workers working on areas with unprotected sides and edges, leading edges, hoist areas, holes including skylights, formwork and reinforcing steel, overhand and bricklaying work, roofing work on low-slope and steep roofs, precast concrete erections, wall openings, residential construction, and more. Not Following Hazard Communication Standards – Employers and workers should always be aware of the types of chemicals and the hazards associated with those. Each chemical should be classified correctly and include a list of hazardous chemicals that are clearly labeled. All employees should be trained regarding the handling of these chemicals during processing, storage, and emergencies. Safety data sheets should be distributed among the workers. Not Following Scaffolding Standards – All scaffolding should be able to support its own weight and up to four times the maximum load without collapsing. The suspension rope that is used on scaffolding needs to hold at least six times the maximum load and each platform should be fully planked or decked appropriately. Each scaffold and planks should measure correctly for the maximum distance depending on the scaffolding’s operations. Not Following Respiratory Protection Standards – Employees working in the general industry, shipyards, marine terminals, longshoring, or construction industries should take precautions against respiratory issues by using personal protective equipment such as respirators. Not Following Lockout and Tagout Standards – Several standards are listed for lockout and tagout processes, but include the servicing and maintenance of machines that if turned on could release energy or be physically capable of harming employees. Not Following Powered Industrial Truck Standards – Employers need to take appropriate measures to ensure the safety of all workers in regards to the fire protection, design, servicing, and use of forklift trucks, tractors, motorized trucks, and other industrialized vehicles. Not Following Ladder Standards – Ladders should be able to withstand up to four times the maximum load with notable exceptions and the rungs should be appropriately distanced from each other. Self-retracting lifelines and rest platforms at intervals are not to exceed 150 feet. Not Following Electrical and Wiring Methods Standards – This standard includes the effective bonding of grounding conductors such as metal raceways, cable trays, cable armor, cable sheath, enclosures, frames, fittings, and more. Not Following Machine Guarding Standards – Guarding methods can include barrier guards, two-hand tripping devices, electronic safety devices, and more to protect workers from flying parts, pieces, sparks, and other hazards while working. Not Following Electrical and General Requirements – Each electrical equipment or conductor needs to be approved, examined, and suitable for the job. The number one OSHA violation listed is not following fall protection standards. Falling at a worksite not only can lead to injury and paralysis, but in many cases, death. OSHA reports that 359 out of 899 total deaths on construction sites were due to falls in the 2014 calendar year (39.9 percent). Out of the top ten OSHA violations listed, 6,721 fall protection violations were cited. OSHA plans to increase the penalty amount for future violations. These fines have not been raised in decades and topped at $7,000 per exposed worker and $70,000 per person for serious violations. The increase will allow OSHA to fine companies close to $12,500 per worker for violations and $125,000 per worker for serious or repeated willful violations. These new penalties went into effect on August 2, 2016. A few of these OSHA violations can be avoided by using the appropriate fall protection systems including universal safety harnesses, tower harnesses, retrieval harnesses, and lifeline rope. The type of safety equipment you use will depend on the nature of your work. Harness Land products are OSHA and ANSI compliant and made with a durable construction to meet the demands of the worker. You can find safety harnesses of all types, lanyards, retractable lifelines, anchor points, fall arrest systems, fall protection kits, and rescue systems. The company also offers confined space equipment including tripods with a winch and working suspension chairs. The staff at Harness Land can help with fall distance calculations to assist you with anchorage and measurements for a shock-absorbing lanyard and D-ring anchorage connector or a retractable lifeline. You can also find useful frequently asked questions and tips to keep your fall protection system in working order, such as never modifying your harness or equipment and only hand washing harnesses. You will also find safety gear at Harness Land which an inspector may look to see if you keep on hand in the event of an emergency. This includes first aid kits, eye protection, hard hats, safety apparel, material lifting, and heat stress safety. You can find a variety of brands at Harness Land including Guardian Fall Protection, Jackson Safety, Elk River Fall Protection, MSA Safety, Genuine First Aid, Protecta, Radians Safety Wear, and more. Whether you are working on a roof, construction site, ladder, or scaffolding, you can find the type of harness or fall protection system you need from Harness Land to avoid OSHA violations. With Occupational Safety and Health Administration’s (OSHA) impending penalty increase, companies must engage workers, understand new technology and make a plan to avoid devastating fines. All it takes is one work safety or worker health violation to severely hinder your company’s business health. With OSHA's close to 80 percent fine increment becoming effective August 1, and its more thorough examination processes, it could be significantly all the more troublesome to attempt to stay up to code. Until lately, a genuine OSHA infringement punishment remained at $7,000. New principles have now expanded the fine to $12,600 and the price goes up from $70,000 to more than $120,000 for repeat and willful violations. This can be devastating for small or medium sized business. There are a variety of steps that any organization can take to stay away from compliance slipups, and guarantee these new, harmful fines are maintained. Leaders and workers can keep thier company on course with these three basic rules to follow OSHA compliance requirements. Build up a society where workers are urged to bring issues to the managers attention, without fear, about potential safety hazards and fall protection concerns. For instance, workers in sewage, wind energy and telecom industries are frequently the ones in the field and on the ground, and may see things the higher-ups do not. By giving an approach to staff to namelessly report possibly perilous circumstances, managers can evaluate the essential safety concerns to improve work environments. Assign a worker or representatives to direct customary safety checks, and execute safety programs so that everybody is on the same page. Give your in-house security reviewer a record-keeping framework like a versatile structure for chain of command, and to guarantee that is safety is front of mind, and management is alerted of potential dangers. Keep focused on current best practices and OSHA requirements by understanding and following the development of safety technology. Follow fall protection safety blogs, like Harness Land, and you’ll stay up-to-date with the latest industry trends. Another thing you can do is download a mobile app that will provide you with keen insight on data and analytics for safety. Mobile apps can have entry to day-by-day review agendas to remain OSHA agreeable, which can give consistent access to ergonomics best practices, crisis administration, development safety, EPA indoor air quality, or forklift security. The stakes for an infringement are higher than at any other time, and even the thought about a fine can threaten your business health. By building a plan early, everybody, from administration to workers, is readied when the time seeks an examination. Much the same as rehearsing for a fire drill in school, when everybody is better educated and all around arranged to experience an examination, workers are prepared. An OSHA assessment can be an alarming prospect and the recently upheld fine increase can place organizations in threat of losing their money and business. With a temperamental economy and continually evolving scene, the last thing your business needs is a fine or infringement that can go upwards of five figures. Follow these suggestions and your association, small, medium or big, can guarantee worker safety and OSHA compliance.